Additional time may be added at the rate of $300.00 per hour. This package allows up to a maximum of 40 people attending including the bride and groom, wedding party and children. The bride and groom dressing room. Music for seated guests, the processional and during the duration of contracted time. Silk flowers for bride and groom to use. And also includes our private lakeside ceremony site at no additional charge! 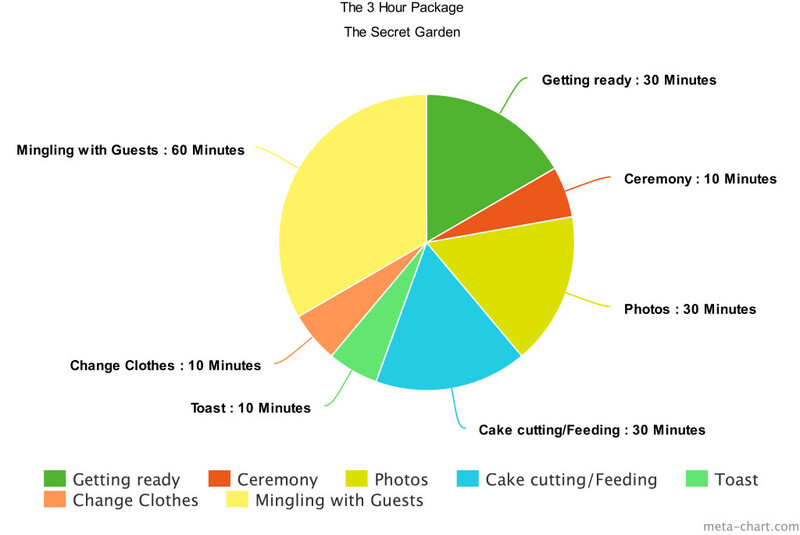 The 2 and 3 hour packages are perfect for a casual mingle, cake and toast time after photos. Having a reception somewhere else? Ask about extending the photography coverage into your existing package. Rev. Gary officiates your marriage ceremony in this beautiful garden setting. The elopement packages are designed as a streamlined package primarily for a bride and groom and do not include music, chairs or the use of the silk flowers. (The elopement packages do not include use of a changing area however extra time may be added onto this package for an additional fee. 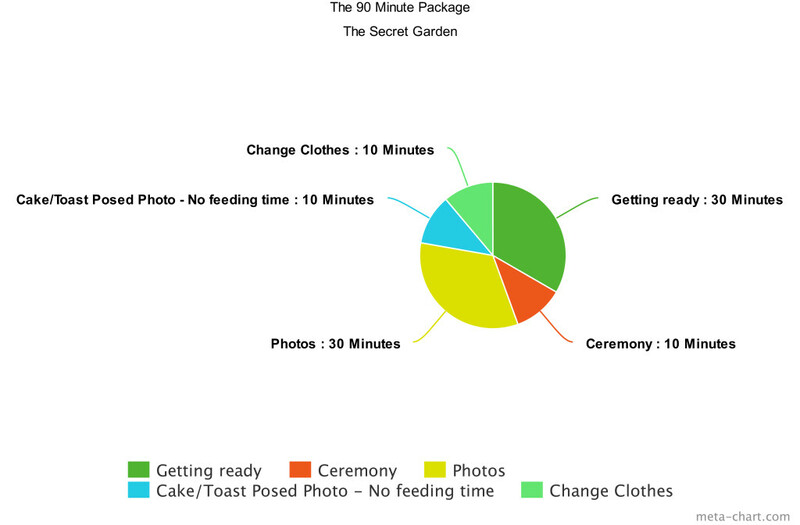 *Use of the changing room must be made in advance at the time of booking otherwise everyone needs to arrive dressed and ready to go to the garden for the ceremony. Please do not arrive more than 15 minutes earlier than your reservation time. * My officiant and photography services are available at others locations. Additional fees may be required depending on the location. *Some restrictions apply – call for details. 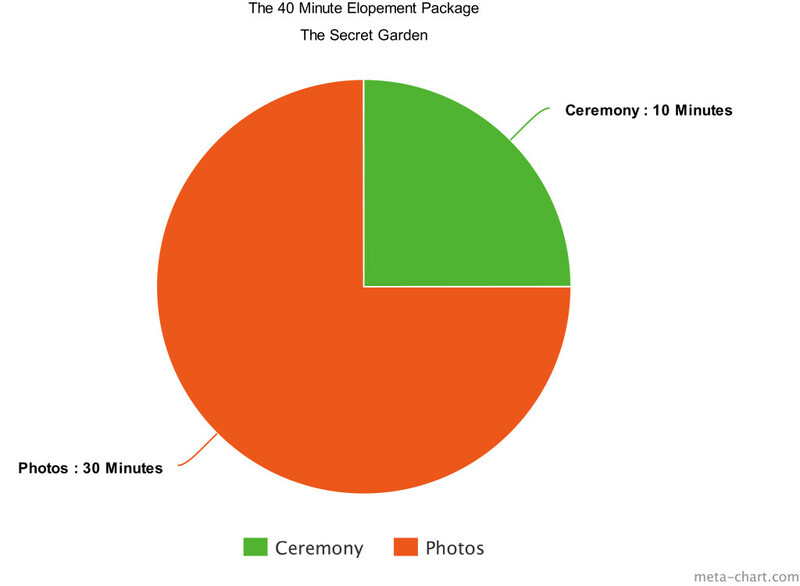 These wedding packages are similar to a courthouse marriage except these are exclusively performed by Rev. Gary Davids at “The Secret Garden” in Longwood with it’s beautiful outdoor garden setting. The Secret Garden is perfect for *up to 40 people. We offer these great deals for those who use our exclusive officiating and photography services. 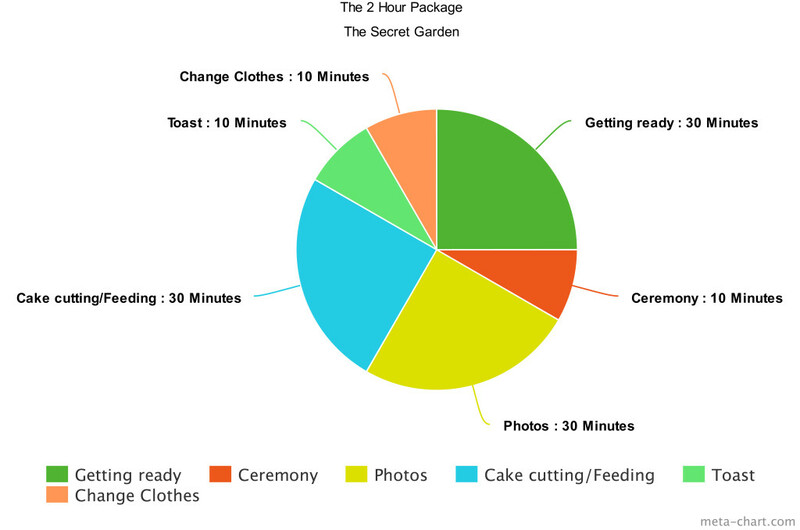 Here are some pie charts that will help give you a good idea of time flow for each package you may be considering. These times are only approximates and may differ based upon the number of guests attending and actual arrival times. You may opt to use more or less time for each event but from experience they are very realistic. Please call if you have any questions. The garden is beautiful as is but we realize that sometimes our guests like to personalize the event with decorations and catering, cake, etc.. Please check with us to see what is allowable and keep in mind that any set up or breakdown time must be figured into the time you contract. Click here to see sample.